Following on from the second instalment of the 'What's the Alternative' series, this article provides an example of how an allocation to a specific real asset sub sector, namely UK long-term lease agreements, can provide investors with an attractive inflation protected return, both in absolute and relative terms. One of the traditional means of providing ‘inflation protection’ within investment portfolios is an allocation to UK index linked gilts. First issued in March 1981, UK index linked gilts now comprise 25% of the stock of debt issued by the UK government. Given the long term inflation linked liabilities of many institutional investors, index linked bonds have become important and widely held instruments. Both the semi-annual coupon payments and the principal are adjusted in line with the movements in the General Index of Retail Prices in the UK, (also known as the RPI). Given this, at an optical level and over the very long-term UK index linked gilts are expected to provide a return in line with UK inflation. Like all traditional fixed income instruments, UK index linked gilts have a face value at issue. Once in the market, they are traded like any other asset, with the price determined by the markets expectations of future inflation and by demand from investors wanting to hedge their inflation risk. Given this, price and valuation are important factors to consider when evaluating UK index linked gilts. Looking firstly at pricing, one of the primary determinants of price change for a UK linked gilt is duration. Given the index-linked gilt market has a much longer effective duration than nominal UK gilts (22.2 years versus 11.4), a small move in yields, can have a large impact on price. Secondly, given the large, and arguably growing, institutional demand for inflation protection in order to ‘liability match’ pension assets and liabilities, the valuation of UK index linked gilts appears expensive relative to history. Real yields have fallen to long-term lows, with the UK index linked gilt market currently trading at -1.66% real yield. This indicates that should UK inflation be 1.7% pa over the long term, the nominal return is close to zero. Indeed, Blackrock estimates the future 5-year nominal return from UK index linked gilts at -0.80% with annual volatility of 10.70%, which hardly feels a compelling investment opportunity. Arguably, the performance of UK index linked gilts march to the ‘drum of duration’ and to the demand from price-insensitive buyers seeking to hedge their inflation risk as opposed to the actual change in UK inflation or to changes in inflation expectations. 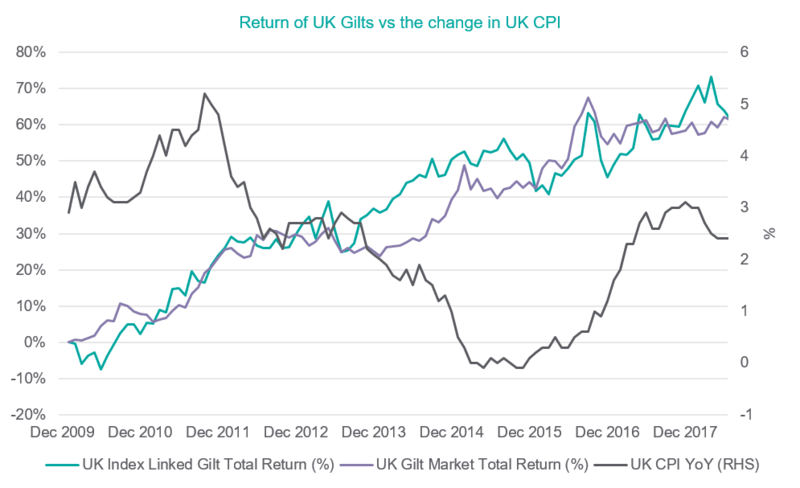 Consider the graph below, displaying the return of UK gilts and index linked gilts versus the change in UK CPI over the last 10 years. It is interesting to note that UK CPI has fallen from a high of just under 5% to the current 2.4%, yet both UK gilts and index linked gilts have risen just over 60% in this period. Far from moving in line with the prevailing UK inflation rate, the primary driver of the return on UK index linked gilts has been the fall in the nominal gilt yield, from 4% to 1.3% at end of July 2018. Should gilt yields rise, it is likely that index linked gilts will closely match the performance of nominal UK gilts, given the close correlation with conventional government bonds, which may negatively surprise many investors. How are we approaching this issue? Many real assets provide some level of either explicit or implicit inflation linkage. We believe one means to add long-term inflation protection to portfolios is through an allocation to specific real assets through long-term UK commercial lease agreements. Investors can access a range of property related strategies including long leases, real estate debt and ground lease funds. Taking the long lease sector as an example, there are a number of closed ended investment companies offering regular, attractive income, with the potential to grow the dividend in real terms through upward only inflation-protected long-term lease agreements. These companies can be sector specific or generalist, but selectively invest in UK commercial property assets let on a very long (typically 20 to 30 years to first break), inflation-linked leases to a wide range of tenants across a diverse range of property sectors. Interestingly, one subset of this real asset class, where valuations appear particularly appealing is the UK supermarket sector. We have written previously with regards the potential value on offer within certain segments of UK retail (click to read), and the chart below highlights the attractive yields available, both in absolute terms and relative to history for the supermarket sector. 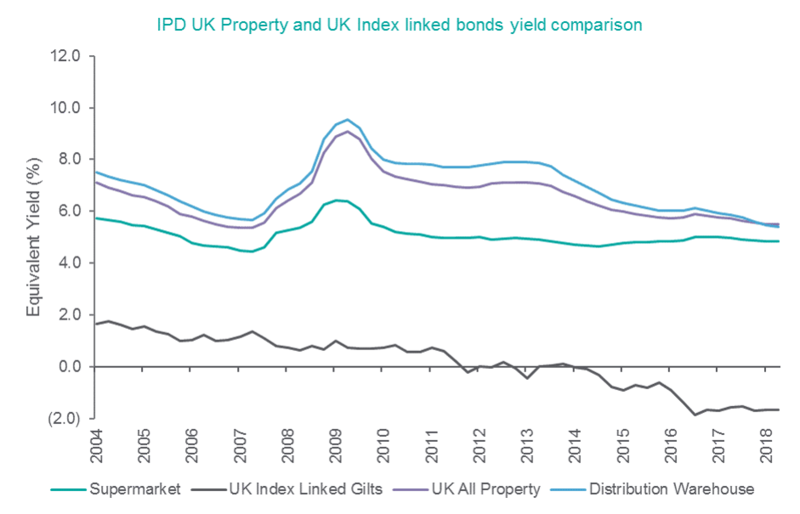 What is also clear from the chart is the growing difference between the current real yield on UK index linked gilts, which has fallen considerably, and the specific super market sector property ‘equivalent yield’. It should be clearly stated that this supermarket yield comprises a combination of UK consumer price inflation (CPI) linked long lease agreements and more traditional open market rent review commercial rent agreements. Given this, the comparison should be primarily used as a measure for how each sector has evolved over time. It does appear, however, the yield on certain UK long lease agreements appear significantly more attractive than the current real yield of UK index linked gilts. Clearly, there is risk to the traditional retail model and supermarkets are not immune from the ongoing disruption from online only operators such as Ocado. However, it is interesting to note, the current ‘Omni channel’ model, first implemented effectively by Tesco, where a store is utilised for the full range of services, including home delivery, click and collect, traditional store purchase, has been followed by Amazon, Alibaba and Walmart. This, to our mind, provides compelling long-term valuation support for high quality commercial property, correctly located, with a secure long-term tenant, at an attractive inflation protected yield. As ever, there is no certainty with investment, yet we believe that traditional UK index linked gilts appear unattractively priced. Given this, an allocation to a specific real asset such as UK long lease commercial property agreements can offer investors long term inflation protected income and thus help solve one of the conundrum’s currently confronting market participants.